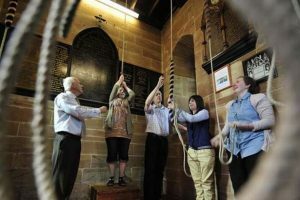 For centuries church bells have been chimed ropes and levers attached to the headstocks from which the bells were hung. The replacement of levers by wheels, which began in 16th-century England, gave the ringers better control of their bells, allowing sets of bells (rings) to be rung in systematically changing patterns. We call this change ringing. Today there are more than 40,000 change-ringers in the British Isles and smaller numbers in Australia, Canada, New Zealand, Southern Africa and the USA. They are young and old, men and women, short and tall, girls and boys, non-musical and musical, church-goers and non-churchgoers. They come from all walks of life, but they share a fascinating hobby and a commitment to their team. Here’s a short recording of the 10 bells of St Michael’s church, Southampton. You can find many other audio and video recordings by visiting the Library of Bell Recordings. The bells are tuned to a normal (diatonic) scale and it is usual to start with ringing down the scale, a sequence which ringers call “rounds”. The order in which the bells sound is then altered to give different sequences called “rows” or “changes”. Changes may be called out individually by the conductor, and this style is known as call-change ringing. Alternatively, the changes may be made to a pre-set pattern or “method”, and each ringer must learn that method in order to know when his or her particular bell must sound in each row. This style is known as method ringing. Call changes and a few standard methods are rung in most towers and this makes it very easy for ringers to visit and ring with other bands. There are many more advanced methods which provide a continuing challenge as ringers gain proficiency over time. Change ringing is also performed on handbells either to provide additional opportunities for practice or as an activity in its own right. It is, of course, popular with groups of ringers who live far from towers with change-ringing bells. Please click here for a more detailed description with a North American flavour. This includes a sound clip and a short video showing ringers in action. A bell being rung full circle. Cutaway view of a bell and clapper. Five bells being rung in rounds. http://www.nagcr.org/pamphlet.html Six bells ringing in rounds, included within the North American Guild’s on-line pamphlet describing change ringing. Bell ringing is good fun! Once you have learned the basic technique you will always be made welcome when you visit other towers. There are more than 5,000 church towers and a small number of secular towers with bells suitable for change ringing. Initial teaching takes place on a one-to-one basis and most beginners will be ready to ring with a band in a few weeks or months. The basic skill lies in being able to control a bell that rotates full circle using a rope attached to its wheel. There is always something new to learn and ringers progress at their own pace, depending on the time and effort they devote to increasing their knowledge and practical experience. send an email to (email) telling us where you live so that we can put you in touch with ringers near you. Please include your town or village name; County and County Town names; and your full postcode.